Ancestry Library Edition is a wonderful tool that is available free of charge at library branches across Lambton County. If you aren't interested in acquiring a personal subscription to Ancestry.ca, the Library Edition is an excellent alternative. The more you know about the website's databases and search functions, the more information you can find about your ancestors. Here are some tips and tricks I learned in a recent webinar hosted by ProQuest that will help you navigate Ancestry Library Edition more effectively! 1. The differences between Ancestry Library Edition and Ancestry.ca? You cannot post on the message boards in Library Edition; you cannot post your family trees in Library Edition; and there are less newspapers, magazines and periodicals available to search in Library Edition. If you found a great obituary at home on your personal Ancestry subscription and could not find it on Library Edition at your local library, this is likely because significantly less newspapers are available in Library Edition. 2. The difference between Ancestry.ca and Ancestry.com? Canadian vs American servers; there is no difference in content. 3. If you're searching for a woman, put both her first name and maiden name in the "First and Middle Name(s)" field, and put her married name in the "Last Name" field to increase your results! An example of a search with the first name, maiden name and married name included. 4. The stars that appear underneath your search results show you how close the search results match your original request. Do not expect to see five stars; to get a five star result you would have to match at least six pieces of information in your search and it is very unlikely! Three stars is considered a good probability of a match. This search returned three stars and could be a decent match. 5. In Library Edition you cannot post on the Message Boards, but you can browse the content that is already online. On the Home page, scroll to the bottom of the screen and you will see "Message Boards" as a link underneath "More Collections." You can narrow your search by location and browse for specific names, making it easy to pinpoint any messages that have been posted about your family specifically. Some of your search options in the Message Boards. 6. 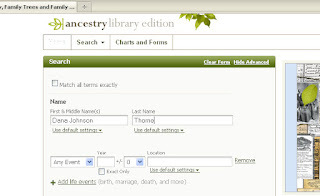 The situation with Family Trees is similar; in Library Edition, you cannot post family trees but you can browse the family trees that have been uploaded. 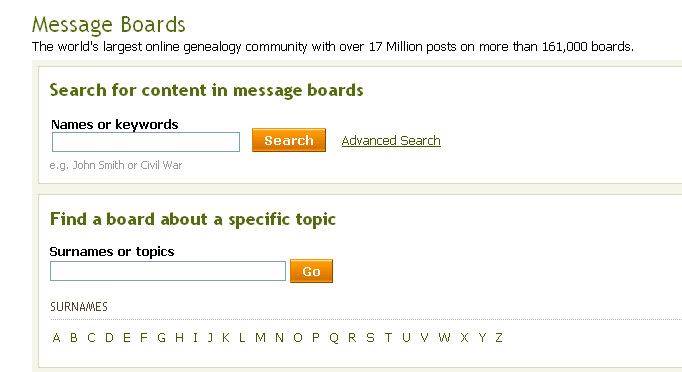 From the Home page, choose "Card Catalog" from the drop down Search menu. On the left hand side of the screen you will see "Filter by Collection," and the last option is "Family Trees." 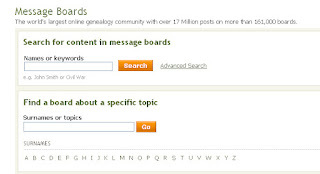 It will return 7 results, and if you click on the "Ancestry World Tree" you can search over 467,671,000 records from family trees that have been uploaded by members to the website! 7. Use wild card characters if you are unsure about spelling. How surnames in your family have been spelled can differ drastically over time! The question mark, ?, represents one unknown character. If you are searching for "Olsen" or "Olson," search for "Ols?n" and you will return results for both names. The asterisk, *, represents any number of unknown characters. If you are searching for "Johnson," "Jonson," or "Johnston," search for "Jo*son" to return results for all those names. 8. There is a photograph collection on Ancestry Library Edition that is often overlooked. If you click on Search from the main Home page, you will see a list of "Special Collections" down the right hand side. The last is "Photos & Maps." Click on "Pictures" and then "View all in Card Catalog." In these 31 results is the "Canada Historical Postcards" collection, with over 26,000 historical postcards from across Canada. You can zoom in on the postcards and view the front as well as the back. 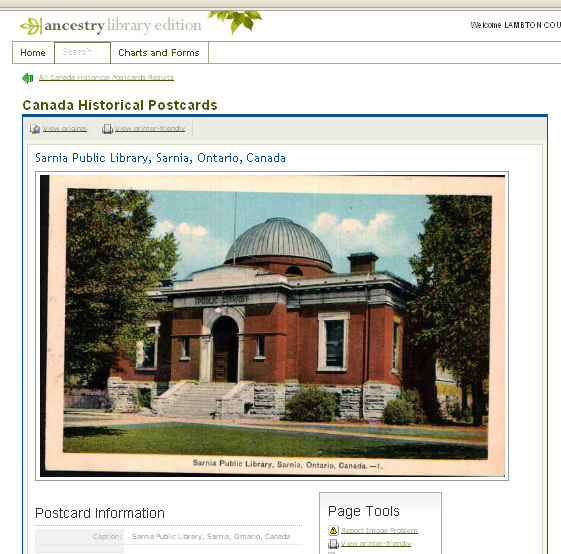 Search for Lambton and see the great postcards that pop up! These images can provide you with context and a real sense of the world your ancestors inhabited. 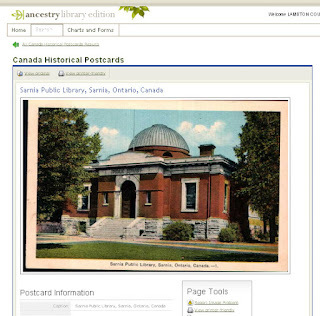 Postcard of Sarnia Public Library from the Ancestry "Canada Historical Postcards" collection. 9. Another interesting database in the "Pictures" category is the "Passenger Ships and Images," where you can find information about passenger ships including years they were in service, the builder, the dimensions, the line it sailed under, and much more! Approximately 1,000 ships also have photographs attached to the records. 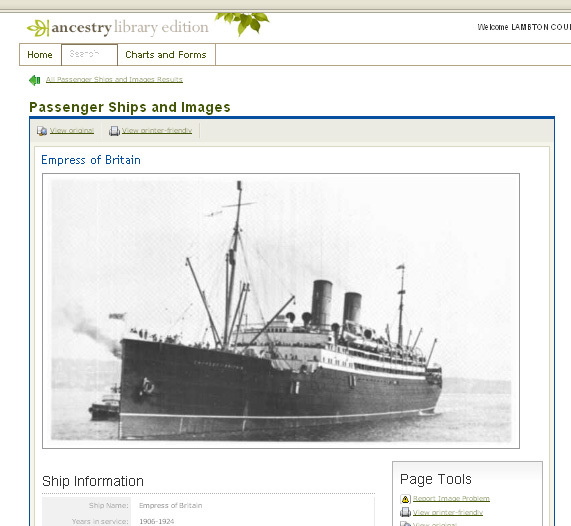 Screen shot, Ancestry Library Edition's information on the Empress of Britain. 10. If you need technical support or you notice problems in citations/indexes that should be changed, shoot an email to libraryedition@ancestry.com with a description of your concerns. 11. One last advisory caution... Now, some of Ancestry's recent advertising has adopted the slogan, "You don't even have to know what you're looking for... you just have to start looking." Ignore this! Always make sure that you are aware of what types of sources you are searching. The type of document and context of its creation are incredibly important in understanding the contents. Pride yourself in researching the types of documents available and being aware of what you're looking at!